This week has made me ask myself just how many of my formative life experiences took place in Nepal. A whole genre of coming-of-age literature suggests to me that nearly everyone has experiences when they are 15 and 16 years old that shape them for life; mine just happened to occur in Nepal. First love. First taste of independence. First major theological questions and spiritual doubts. First introduction to what poverty and privilege look like. This is what I looked like when Nepal helped to shape me into the person I have become. Sometimes it takes looking at a picture like this to realize just how young we were. I am not proud of the reason I went to Nepal. I was a teenage missionary with a sketchy youth organization called Teen Mania. I was there in the summers of 98 and 99 for two month stretches of time. 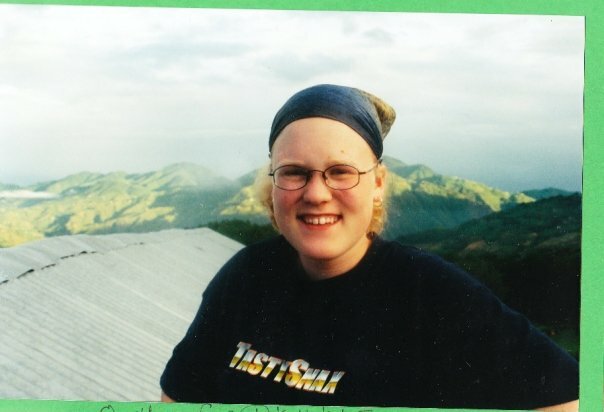 In 1998, there were four teams of us, and we spent our days going to towns and villages doing evangelistic dramas meant to convert people to Christianity. Then, in 1999, I was on a much smaller team of just 18 teenagers, and we lived in a single village with the misguided intention to “plant a church.” There’s a lot to the story of what we did there that was unethical, and what was questionable, and a very small handful of things that may have been good. That is a story I tell in my MFA thesis, though. It’s not the story I want to tell today. I want to tell you about a moment in Nepal that I have been thinking of since the news of the earthquake. Our rickety bus rattled to a stop behind a dump truck and a line of rusty brown cars. Heads snapped up, waking from tentative naps. To our left, the muddy Trisuli River rushed far below us. We were high in the Kathmandu Valley, stopped on the curving path from Pokhara to the Kathmandu. I was one of twenty teenagers in the rented bus, all of us American. For the last week, we’d fallen asleep each night at the base of Mt. Anapurna, moonlight falling through our open guesthouse windows. Now we were on our way back to our home base: Hotel Narayani, where we ate big breakfasts of breaded potato cakes and hard boiled eggs, swam in the pool, and ordered chicken noodle soup and french fries from room service when we got back late at night. As the brakes squealed through the bus and my teammates were jostled from their naps, our leader Bobby rose from the seat in front of me and walked to the driver. They spoke and we all stared, wondering what was up. We couldn’t see anything beyond the dump truck in front of us, couldn’t hear any shouting, couldn’t have guessed what was going on. There was one sandy road leading from Pokhara in the west to Kathmandu in the center of Nepal. It trailed through small villages on the ravine-line of the Trisuli, and suddenly traffic was at a standstill. We had just run out of the bread we’d been making peanut butter sandwiches out of for the last week. Dinner was waiting for us in the city. We were all hungry and tired – one of the boys had already passed out earlier in the day from heat exhaustion – and any delay was an unwelcome delay. We shifted our weight in plastic-y cushioned chairs and lowered our windows. We continued our conversations and tried to ignore our growling stomachs. The tall, skinny boy who’d passed out at our last drama spot alternated between nursing our final bottle of water and sucking on an orange Tootsie-Pop. When the bus killed its engine and the wait grew longer, we became restless. “Can we climb up onto the roof?” the boys asked, and Bobby shrugged permission. They climbed through the hatch in the roof, and from my seat I heard their feet clunking hard on metal and watched as someone was dropped from the top of the bus to the ground below, laughing loudly. Rumors circulated – there had been an accident up ahead. Several moved to the stone ledge outside, dangling their feet over the daunting drop-off. The wait continued for a half an hour, then an hour, then another. We announced what cassette tapes were in our Walkmen, and taking a vote, we chose what to play loudly over the speakers. Rumors grew more concrete – someone had been killed. I thought of my circle back home, still reeling over the too-recent death of a friend in a car accident. Traffic was backed up after her death, too, I’d learned from the newspaper clipping Mom sent me earlier in the summer. Bobby decided to walk into the village up ahead to try to buy some bread for us. Maybe a town bakery would still be open, would still be stocked with some loaves of bread. The sun went down. We were all instructed to pile back into the bus and wait. A cacophony of cooped-up teenage voices echoed into the valley. Laughter and music and the sound of some strips of PCV pipes that we had turned into makeshift swords for play fighting. Eventually Bobby returned, somber and breadless. He had reached the bakery, only to learn the details of the day’s delay. A child was struck by a driver who feared that he would be held responsible for the girl’s medical care. It would be better for him if she died, rather than be gravely injured. He backed over her again, killing her this time, and fled. Her family, devastated and enraged, rallied together the village’s residents. They piled up old tires and trash in the road and set the heap on fire. They sent word to the next town: Stop him. Hold him. We’re coming for him. Not one car will get through until we do to him what he did to our girl. “How did you find all this out?” we wanted to know, our voices quiet at last. I cried into my hands while others sat in silence. Eventually, eight hours late, we reached Kathmandu. The woman who cooked our dinners, fed us until our bellies ached. It didn’t take long for everyone to be shouting and singing and play-fighting once again, putting from their minds the day’s events. But as I listened to our culture of noise, I wondered if our laughter – our cold, oblivious laughter – had traveled from our bus, down the curvy road, and to the ears of the family kneeling over their dead child’s body. And what if it had? I’ve thought a lot about that moment on the road to Pokhara this week as life has moved on here in the States, even as Nepal has ground to a halt. On that bus, my friends and I were oblivious to the pain that was unfolding in front of us. I can’t stop looking at the pictures from the earthquake. Yesterday, a Nepalese man told an NPR reporter that a building had fallen, and there were children trapped underneath. For the first two days, as they tried to get the children, the family could hear them crying and calling out. On day three, the children were silent. I wrote the essay above before I had children. These days, I don’t know if I could write it in the same way. If I were to write it now, the focus would likely shift to the mother of that child and the great injustice that is any child’s death. The focus of that essay as I wrote it, though, is on my fifteen-year-old self and the inherent selfishness of being a white missionary kid in a developing country without a clue about the concepts of privilege, power, coercion, elitism. We were noisy, and we were obnoxious, and we were oblivious to the fact that life and death was happening all around us. I’d like to excuse the behavior has being a kid, but isn’t that how we live our lives constantly? Since the earthquake rocked Nepal and killed over five thousand people (with a death toll that is rising), I have taught seven classes. I have gone out to eat for Mexican food, and I got a haircut. I have watered my vegetable garden and soothed my baby through a few rough nights of teething, and I have graded a dozen or so student essays. I have talked with my friends about work, t-shirts for an upcoming church event, and how much we liked Interstellar. My life isn’t changed by the earthquake, even though it makes me sad to think about. What I want to do is focus on the people whose lives are changed. I don’t want to be oblivious. I don’t want to be laughing and complaining on that bus. And so I look at the pictures. I listen to the stories on NPR, even though they make me cry in the car on my way to work. I ask myself what I can do to help. My life is better because I’ve known and loved Nepal. I hope that because I have known and loved Nepal, I can do something that makes the lives of people there better, too. The only way I know to do tat right now is to ask people to give money to the relief efforts. At the very least, I hope I am respectful of the losses they have suffered, and that I keep in mind that there are families who are never going to be the same after this. To donate to the earthquake relief efforts in Nepal, consider these options. To understand the devastation of the earthquake, here are some galleries of images. Thank you for this, Liz. This was wonderful. Yes Liz, Teen Mania is an awesome Mission for youths.I was there watching those teen missionaries so close in Hyderbad ,India, 98,99,00. Its a blessing to me.